I took some German visitors around my home city, Manchester, last week. They had been given to believe – not by other Germans, but by southern Brits, who clearly did not have a clue what they were talking about – that Manchester was a run-down disaster of a place. My guests - art and architecture enthusiasts from Munich - could not have been more astonished at the reality. They were staggered at the beauty and majesty of much of the city’s architecture – old and new – the great cafes, pubs and restaurants, and the varied, fascinating and fashionable shops. We took in the City Art Gallery, with its Pre-Raphaelite wonders, St Anns, St Marys – The Hidden Gem, the Royal Exchange, John Rylands Library, Castlefield, Little Venice and much more. MOSI (the Museum of Science and Industry) was next on the list, but we ran out of time. 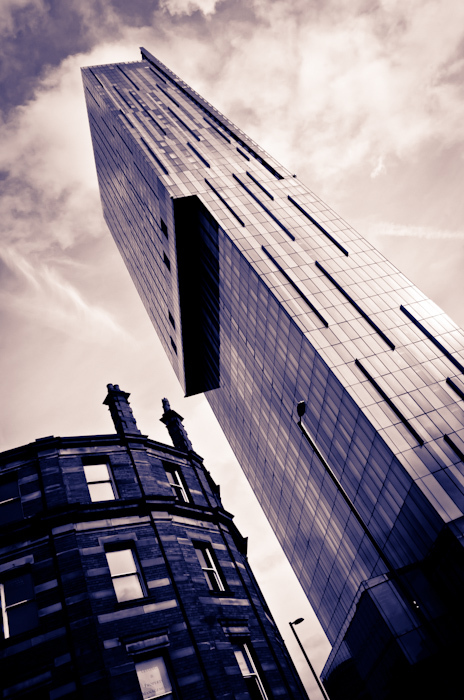 This shot of the Beetham Tower (Hilton Hotel) is one of dozens from the tour. This unique structure remains an absolutely stunning and compelling sight on the Manchester skyline, with its gravity-defying overhang (and, seen from this angle, overtones of the Easter Island statues??). My friends stayed in the Northern Quarter, where they loved the arty, bohemian feel of the place and enjoyed the laid-back bars and eateries. And now, having seen the real Manchester for themselves, they intend to come back, but maybe next time The Hilton will be their hotel of choice.